It's matching fun with Dory and all her friends! 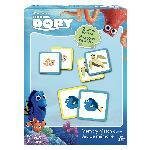 Match images with Finding Dory Memory Match from Spin Master Games. It’s matching fun with Dory and all her friends! Match images with Finding Dory Memory Match from Spin Master Games. Flip over tiles, find matching pictures, and keep going. Collect the most pairs and you win. Just keep swimming with Finding Dory Memory Match! Flip over two tiles, two at a time. If the pictures match, you keep them — and keep going. Collect the most pairs, and you win. Finding Dory Memory Match is made for 2-4 players ages 3+. No batteries required.